Pierre Hermé ‘s newest store lies in London, Selfridges. First got to know about it from parisbreakfasts (a brilliant blog written by someone with a passion for macarons and anything french! The link is on my sidebar) and boy was I excited because I have so many friends studying there! Dad popped by London during his recent business trip and surprised me with two boxes of Pierre Hermé 😀 Thanks dad! It made studying for those two days (yea, I had to eat them quickly or they won’t taste so good anymore) less painful. 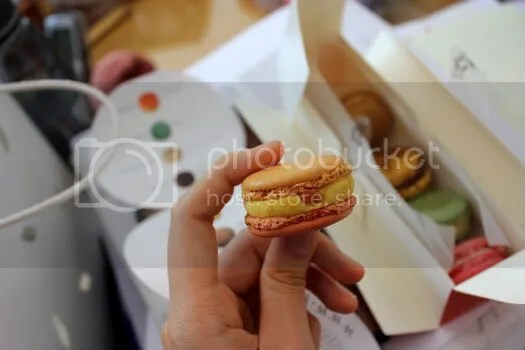 There are a few things you can expect when you take a bite into PH’s macs: a thin crisp shell, thick ganache centres, tender not chewy shells and flavours that are very pronounced. He has a huge range of flavours (well huge would be an understatement really), some appearing only seasonally. 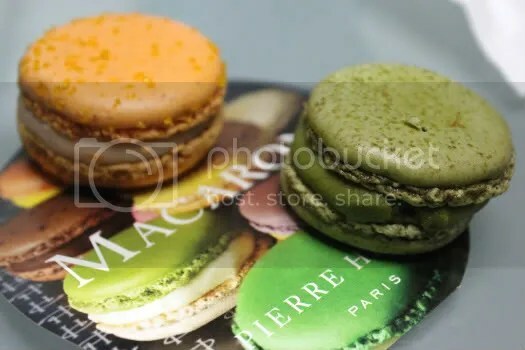 The above double-toned macaron, Huile D’ Olive & Mandarine, is a mix of olive oil and mandarin orange. 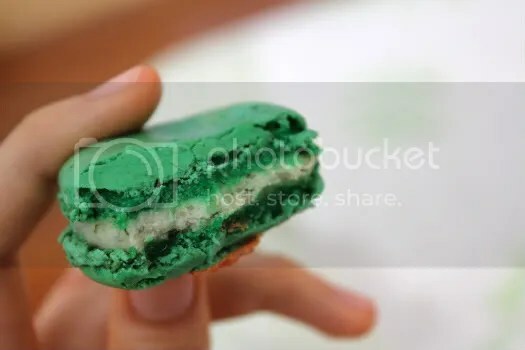 The strands of orange pulp imbues a strong citrusy flavour to the macaron that, in my opinion, overpowers the mild fruity notes of the olive oil. This won’t be one of my top choices from PH, but only because I feel the flavour combination isn’t the best. The Métissé is quite an eclectic combination of carrot, orange and cinnamon. Odd as it may sound, I liked it quite a lot! Contrary to other reviews, the taste of carrots was quite apparent to me with citrusy notes dominating the aftertaste. Couldn’t taste the cinnamon but oh well, I can’t imagine how it’ll taste like with cinnamon gosh! And the candied carrot is cute- odd (who makes vegetable candy?!) but yes, cute. 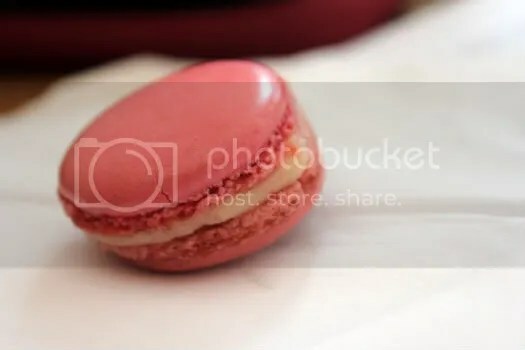 One of my favourite flavours is rose, and PH truly does make the best Rose macaron on earth. The flowery scent of his rose macaron is so organic. The frangrance isn’t mild, nor overpowering to the extent that you feel like you just ate perfume. 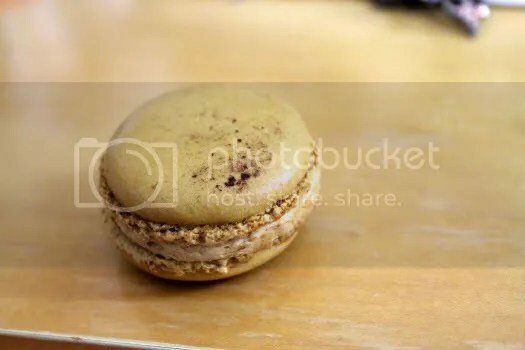 It’s probably one of his more understated macarons -no glitter or inserts like gelee etc, but still one of my favourites. Simplicity, is the ultimate sophistication. PH calls this the Infiniment Caramel, which is really salted-butter caramel. This is a very common flavour, but the ones I’ve had from Adriano Zumbo and Canele both add the real thing -a sticky layer of caramel- between the shells. PH on the other hand, infuses it into the ganache. The result? A buttery sensation that highlights his skill of locking flavours into the ganache. 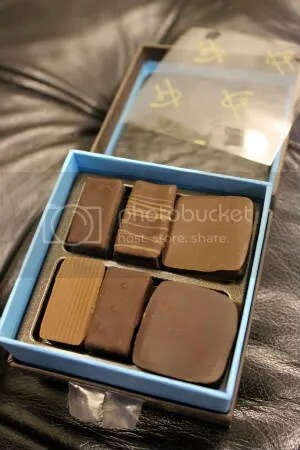 Infiniment Chocolat (bottom) is another classic flavour executed so well by PH. Made from pure origin Venezuela Porcelana Dark Chocolate, it will certainly not disappoint chocolate lovers! 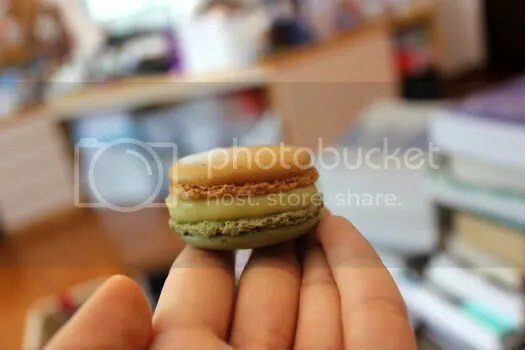 I was quite bummed about not getting to taste PH’s green tea macarons the last time I was in Japan. Dépaysé, which translates to “out of one’s element”, boasts matcha green tea, azuki red bean, lime and ginger. 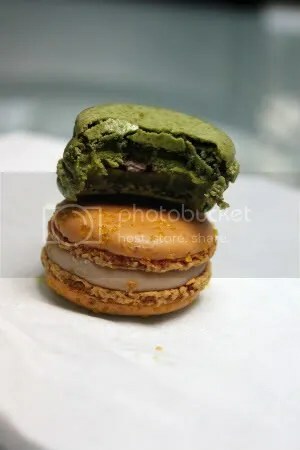 I couldn’t tease out the latter two ingredients (again, I’m thankful I can’t) but the matcha powder was so bitter and grassy, a stark contrast to the sweet adzuki red bean filling. PH is most certainly not out of his element at all. This is probably one of my PH favourites along-side Rose and Chuao (a decadent mix of Pure Origin Chuao Dark Chocolate, Blackcurrant and Blackcurrant Berries). Coing & Rose is a lovely mix of Quince and Rose, quince being somewhat related to apples and pears because it’s also a pome fruit. It’s slightly tart, very unique and prior to this I never tasted it before. The rose flavour is very light, I doubt they used rosewater. Another flavour that really surprised me was Huile D’Olive et Vanille, a combination of vanilla and olive oil. 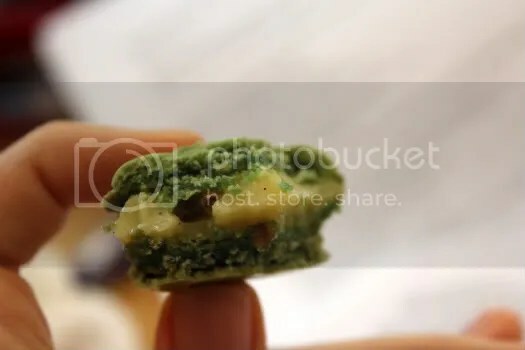 As you can see there are bits on green olive inside. The slightly metallic taste of the olives is nicely balanced by the mellow notes of vanilla. I think it’s quite an ingenius combination but then again, which PH combination isn’t ingenius? His chocolate bonbons are less memorable, though I must say these bonbons from Selfridges tasted much better than the last ones we had from Paris in 2009. The box itself is very chic don’t you think? Fits the minimalistic design of his shop. 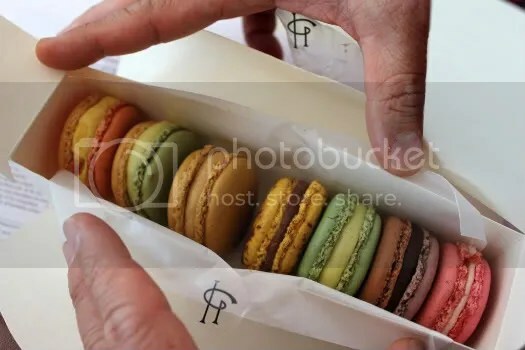 If you like your macarons chewy and sweet, I doubt PH will be your cup of tea. 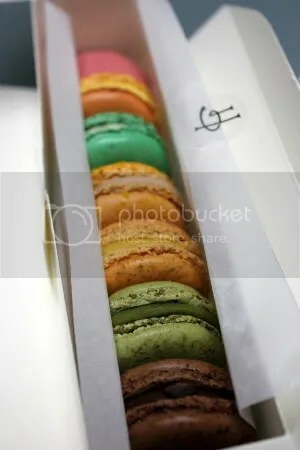 Still, PH is a must-try for all macaron lovers. They don’t call him the king of macarons for nothing!